A deep respect for tradition with a determination to move forward into the future. That’s our guiding principal at Burnette Shutt & McDaniel. 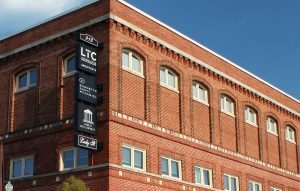 It’s no coincidence that our offices at 912 Lady Street in Columbia’s historic and energetic Vista District reflect those same values. Our location became part of Columbia’s commercial scene in the early 20th Century. Farmers bringing their products to market on Assembly Street used the site as a campground. Three natural springs in the areas made it a perfect location. In 1916, Kirkland Distributing Company built a permanent structure at the site. At that time, the area around Assembly Street was becoming an important commercial area in growing Columbia. Its mix included small retail shops plus feed stores. The area was a bustling cotton warehouse district and a railroad hub. The Kirkland building’s sensible aesthetic was part of Columbia’s visual diversity at the time. A delightful mix of architectural styles dotted the city and the district, from the Greek Revival stylings of the South Carolina State Dispensary Warehouse to the intricately detailed terra cotta façade of the Consolidated Building. Notable features of the Kirkland building – the flat roof, stringcourses delineating the floors, marble and stone insets and arched windows on the first and third floors – remain part of the industrial chic vibe today. The building housed a variety of other businesses until Hinson Feed and Seed Co. moved in in 1966. The Hinsons remained until 1995, by which time the building had been placed on the National Register of Historic Places. An architect subsequently restored the building Burnette Shutt & McDaniel now calls home, making the old new again but leaving its character intact. We, too, have renovated the space to reflect our personal style. From original heart-of-pine flooring to exposed wooden columns and brick walls, though, the city’s history shines through.